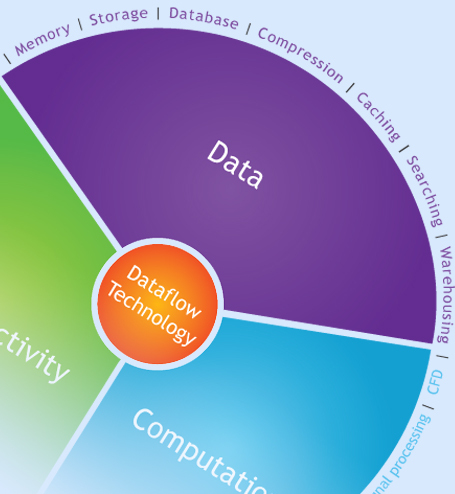 Maxeler’s dataflow computing platforms are ideal for “big data” problems, with large onboard memories backed by high performance computation capabilities. The MPC-X series dataflow nodes provide up to 384GB of DRAM and ultra high speed connectivity to other nodes, in a dense 1U form factor, allowing problems that might normally use disk or multiple nodes to run in memory on a single node. DFEs can incorporate lossless or lossy data compression into application dataflows, directly multiplying memory capacity and bandwidth and allowing terabytes of data to be held in memory within a single node. For database or data analytics applications, DFEs can compute bulk data processing such as joining or merging while holding the entire database in memory (possibly in compressed form). Alternatively, DFEs can provide a ultra low latency caching layer (for example a key-value store) between backend storage or database and front-end services.